It was a perfect summer day in August 1978, almost exactly ten years after the armies of five Warsaw Pact countries had invaded Czechoslovakia to suppress the democratic aspirations of the Prague Spring. In the mountains between Poland and Czechoslovakia, a mountain range spelled Karkonosze on the Polish side and Krkonoše on the Czech side, two separate clusters of tourists hiked up Mount Śnieżka toward a part of the border that since the early 1960s had officially been called the Path of Polish-Czechoslovak Friendship. The two groups emerged from opposite slopes onto this trail ostensibly approved for day-trippers and sat down to rest at one of several picnic tables fashioned from tree trunks. There were eight of them, “1968-ers” in their respective countries, members of a generation that had been shaped either by the Prague Spring’s promise of a non-authoritarian version of socialism with a human face — or by the March 1968 student rebellion in Poland calling for freedom of speech. They were already known in the West by name as dissidents whose inventiveness in outsmarting the authorities through social self-organization had frequently led to their arrest and imprisonment. Years later, Adam Michnik recalled: “We were rather amused by what the foreseeable reaction of the security service agents would be when they heard about our meeting. A few criminals from both countries, meeting illegally, declaring the need for friendship and cooperation between nations – there was something of the theater of the absurd in this.”[ii] From the viewpoint of their respective governments, they really were villains and criminals, though in little more than a decade they were to become parliamentarians, ministers, and presidents in Prague and Warsaw. Anna Šabatová, Czech dissident, who discovered the Path of Polish-Czechoslovak Friendship on an old tourist map, was no doubt feeling the irony of its name when she suggested that it would be the perfect place for a first meeting of the dissidents plotting democracy in both countries. The “path of friendship”, so designated for propaganda purposes and so redolent of socialist happy talk, would finally become what’s been called a “happy performative”, as the very name began to put its own implications into effect. [iii] These mountain meetings turned that path into what it had been promising all along — a site where the language of broken promises was exposed and authentic friendships were forged. That first meeting initiated more than 30 years of dialogue, cooperation, and mutual help. Over the next 11 years, the Polish-Czechoslovak border became the active edge of collaboration between two democratic undergrounds. After 1989, when former dissidents became key players in the new democracies, their dialogue continued to provide support and inspiration, though the problems they faced were now altogether different. 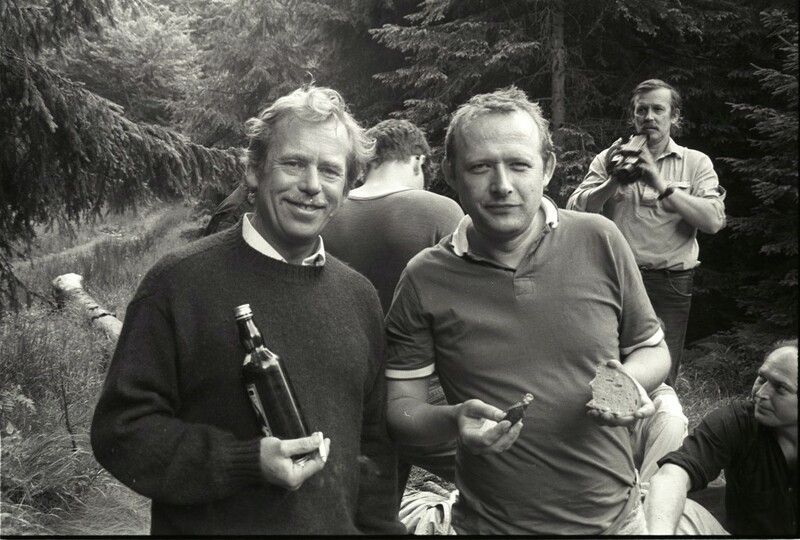 Václav Havel was entrusted with the Czechoslovak presidency, and Adam Michnik became the editor-in-chief of the most influential daily newspaper in Central and Eastern Europe, but their conversations, meetings, and correspondence never ceased. The record of these exchanges provides a fascinating journey through the questions, challenges, and dilemmas of the first twenty years of democracy in a region held in the grip of totalitarianism for more than half a century. The letters, interviews, and essays in this book permit us to reconstruct significant portions of the Havel-Michnik dialogue and their insights into the many complex meanings of citizenship and democracy. This meeting on the Path of Friendship was the first face-to-face encounter between people from two dissident circles, the Czechoslovak Charter 77 — the Chartists — and the Polish KOR (Committee for the Defense of Workers). At a second meeting a month later, other key actors also showed up: Anna Šabatova, Peter Uhl, Jaroslav Šabata, and from the Polish side Zbigniew Romaszewski. Recorded interviews with KOR’s new Czech friends were published in the Polish samizdat newspaper Biuletyn Informacyjny. Polish dissident Jan Lityński, who was at every meeting with Havel, remembers that they always concluded with the writing of a joint statement, and though the text had to be somewhat formal, it amounted to a report of joy and hope that could be summarized very briefly: “We are here TOGETHER and WE WANT DEMOCRACY!” The plans for the third and largest mountain gathering, scheduled for November, were leaked, leading to arrests in both countries. The crackdown was particularly heavy on the Czechoslovak side, and as a result face-to-face meetings had to be avoided for the time being. Jan Józef Lipski remembers that even phone calls from Prague friends stopped coming in. [v] At the same time, however, Charter 77’s successive teams of spokespersons continued releasing an impressive number of statements documenting human rights abuses in Czechoslovakia, including one about the action by Czechoslovak and Polish police to prevent the November gathering[vi]. That first meeting in August 1978 took place only two years after thousands of workers held protests in the Polish cities of Ursus and Radom. These had led to massive repression and imprisonments, but ultimately to the formation of the most resourceful platform for social self-defense and self-organization in the region: the Committee for the Defense of Workers (KOR). It was KOR that brought Polish intellectuals and workers together for the first time in this part of the world. The August meeting also came two years after the Plastic People of the Universe, a Czech rock band, had been arrested, tried, and convicted for “organized disturbance of the peace”. As a consequence surely unintended by the authorities, this crackdown on the alternative cultural scene brought intellectuals together in signing a letter of protest, and ultimately led to the drafting of Charter 77, signed on January 1, 1977, initially by 243 Czech citizens. When it became blatantly obvious that the Polish workers’ state had turned against the workers, and that the Czechoslovak state had — as Jan Patočka put it[vii]— turned against its own children, the regimes could no longer be defended even by their diehard supporters. There is no doubt that emerging initiatives such as home-made publishing, independent research, and alternative education were emboldened by the 1975 Helsinki Agreement on Human Rights, which most of the Communist states had endorsed. [viii] This international instrument quickly began to lift the feeling of desolation, since the imprisonments, tortures, and detentions for spreading information could now be reported. There were addresses in Paris, London and Munich where the reports could be filed and phone numbers where calls could be received. And those addresses provided a direct link to the other partners to the Helsinki agreement: Western governments and their organs of public opinion. Kuroń, co-author of the 1965 Open Letter to the Party, a passionate critique of the system’s deceptive mechanisms, was meeting for the first time an only slightly younger Václav Havel, author of the 1975 Open Letter to Dr. Gustáv Husák in which he writes about a society driven by fear and reveals the close association between the socialist system’s moral and social maladies[xi]. In this first conversation, Havel must have talked about his belief in the value of moral acts of resistance against the system. Unlike KOR, which had thousands of people supporting its activities in big and small ways, the circle around Charter 77 was relatively isolated. No longer teaching at universities, or acting in theaters, they were working as bricklayers and window-washers, and many saw them as “a bunch of Don Quixotes”. [xiii] The wave of repressions after 1968 had been serious and long-lasting, and an atomized Czech society seemed indifferent to gestures that might have appeared foolishly heroic. With the heightened police court actions against the Charter 77 signatories, the dissident community, in order to inform the public about the situation and to seek support for the imprisoned and their families, established a Committee for the Defense of the Unjustly Prosecuted (VONS) just four months before the meeting on the border. While the story of that picnic along the mountain ridge reveals the extraordinary circumstances in which the The Power of the Powerless was conceived and published, the collaboration that followed illuminates workings of what many considered the hopeless project of building a democratic opposition against both countries’ autocratic regimes. An enduring political collaboration and personal friendship began with the written word at its very center: forbidden books, journals, essays and poetry. By the time the sizable volume of Krytyka had reached various underground “shops” in private apartments a few months later — or the backpacks of student-distributors — Havel had already been arrested for his “anti-state” activities, and a whole wave of arrests, raids on homes, and seizure of records on the Czechoslovak side had forced a temporary hiatus upon the regular mountain meetings. Among those arrested with Havel were Jaroslav Šabata and Tomáš Petřivý, who was badly beaten by the police, kicked out of the university, and forced into military service. But this did not put an end to the dissident Polish-Czechoslovak collaboration. On October 3rd, 1979, three weeks before the trial in which Havel was sentenced to four and a half years in prison, twenty key members of the Polish democratic opposition, to protest the arrest of their Czech and Slovak friends, began a solidarity hunger strike in the Church of the Holy Cross in Warsaw, opposite the main gate to the Warsaw University campus. Among those on the hunger strike were Havel’s Polish friends from Mount Śnieżka — Kuroń , Michnik, Lityński—as well as the well-known actress Halina Mikolajska, theater director Jerzy Markuszewski, poet Jacek Bierezin, and writer Anka Kowalska. Warsaw was informed about the action through thousands of flyers published underground. Two days later a group of Polish peasant activists joined the solidarity strike in support of “our Czech brothers” in a village church in Zbrosza Mala, and on October 7th a hunger strike was undertaken by dissidents in Prague. The protest in Warsaw lasted a week, with Doctor Marek Edelman, the last surviving leader of the Warsaw Ghetto uprising, providing medical care and the distinguished historian Jan Józef Lipski serving as spokesman. Separate protests were organized by SKS, the Student Solidarity Committee, in front of Czechoslovak Cultural Centers in Warsaw and Krakow. The secret police in both countries were extremely agitated and blamed “anti-socialist elements” for disturbing the peace with these illegal outbursts. Meanwhile, The Power of the Powerless began its real life in Polish[xix]. Havel’s essay, highlighting the importance of small acts of courage to resist living in a lie, landed on well-prepared ground and spoke to readers immediately. It harmonized with an argument introduced by Leszek Kołakowski in his 1971 Hope and Hopelessness and advanced by Michnik in his 1976 The New Evolutionism. Michnik opened up new horizons for the region’s dissidents, arguing for a strategy of gradual non-violent change entailing small, speech-based steps forward. A Polish philosopher at Oxford, an unemployed historian in Warsaw, and a Czech playwright who could not get his plays performed in Prague, asked in a succession of writings not to wait for help from abroad or for the system to correct itself, not to seek quick fixes nor to count on miracles. They argued that small step-by-step changes could be advanced in three ways: by exposing as widely as possible the contradictions, absurdities, and incompetence within the system itself; by being cautious about the temptations of either collaboration or violent confrontation with the authorities; and by taking advantage of the human rights instruments provided by the international Helsinki agreements. [vi] In 1978 alone over 50 documents prepared by Charter 77 were issued, ranging widely from open letters to commentaries on persecutions, a communique on the safety of nuclear power stations in the country, an analysis of the situation of the Roma (Gypsies) in Czechoslovakia (5,200 words), a letter to the Czechoslovak Prime Minister requesting the lifting of the surveillance of Charter ’77 spokesman Vaclav Havel’s home, a list of further signatories to Charter 77, and a New Year’s message to democratic public opinion expressing the wish that fundamental human rights would be gradually implemented in Czechoslovakia. The statements were published in a mimeographed newsletter Informace o Charte (Infoch). [vii] Jan Patočka, distinguished philosopher and a spiritus movens behind Charter 77, referring to the trial against the Plastic People of the Universe, said: “Could you understand, sir, how it is at all possible that the regime oppresses its own children?” in Peter Balun, Karta 77. Wola ponad siłą (Charter 77. Will over strength), Karta quarterly, nr. 51, Warszawa 2007, pages: 102-139. [viii] The Helsinki Agreement on Human Rights was part of the Final Act of the Conference on Security and Co-operation in Europe in Helsinki, signed at the conclusion of the conference on August 1, 1975. The conference was to lessen cold-war tensions between the Eastern (i.e. Soviet Union and its satellite countries) and Western parts of Europe. The Final Act, signed by 35 European countries, recognized the inviolability of the post-World War II borders in Europe, but it included a pledge to respect human rights and fundamental freedoms. Though it was a non-binding agreement which did not have treaty status, it was a major diplomatic accomplishment that produced declarations on the principles guiding relations between participating states, along with three “baskets of co-operation” between East and West. The first basket was concerned with the political-military aspects of security; the second covered cooperation in areas of economy, technology, science, and the environment; and the third basket addressed matters of a humanitarian dimension, human rights and fundamental freedoms. [ix] Jacek Kuroń a co-founder of KOR, was a dedicated educator, and in his youth a leader in so-called “red scouting”, a 1950s Polish version of the Soviet pioneer organization modeled on the teachings of the Soviet pedagogue, Anton Makarenko. But Kuroń’s scouts, in a fudging of orthodoxy, were encouraged to be active, critical, and creative — and they were. In the 1970s, many of them became instrumental in creating various outlets for democratic opposition in Poland. [xi] Gustáv Husák was a long-time functionary of the Communist party, who, following the Prague Spring and with support of the Soviet Union, replaced Alexander Dubček as First Secretary of the Czechoslovak Communist Party. Havel wrote his open letter to Husák in April 1975; in August Husák became president of the country. [xv] A monthly Informace o Charte (Infoch), typewritten and mimeographed newsletter ca. 20 pages long, that published declarations, information on imprisonments and abuses of the regime, along with the names and addresses of the editors, was distributed in Prague since early 1978. The complete digital version of the newsletter is provided at http://www.vons.cz/information-Charter77. [xvi] Krytyka (1978-1994), published by the underground publishing press, NOWA, had on its editorial board the Hungarian dissident Miklós Haraszti . It was a sizable publication (150-300 pages per issue). Among its authors were Czesław Miłosz, Milan Kundera and Józef Tischner. Beginning in 1983 Krytyka published its own book series and among its 40 titles were Havel’s “Political Essays” (1984) and Hannah Arendt’s “The Origins of Totalitarianism” (1989). [xvii] Documents listed in “Ten Years of Charter 77”, Vilém Prečan, op. cit. [xviii] Petr Blažek & Grzegorz Majewski, op. cit. [xix] The Power of the Powerless was published in the 5th issue of Krytyka (1979), along with essays by three other Czech intellectuals: Václav Benda, Peter Uhl and Jiří Němec.